Adventures in CSA (Week 1): It Begins! My first veggie box arrived! Woo hoo! Well, technically, it’s a fruit-and-veggie box, but I can be excited anyway. The boxes showed up to work this afternoon and, though I brought in my green bags to help making the haul home easier, the nice people doing the CSA for us put them in boxes with handles, so it was easy enough to carry it the 10 minute walk from my desk to my car. Can I eat more fruit and veggies during the week (and also encourage the same behavior in the rest of the family)? Can I branch out and try more fruit and veggies – incorporating stuff I don’t usually cook with and/or trying stuff that I’ve previously been kinda enh about eating? Can we eat more organically and realistically incorporate more fresh produce into our weekly meal plan? And, lastly: can we manage to save any money going this route rather than buying at the grocery store? I don’t think that #1 or #2 are that hard. It’s possible that #3 will be more of a stretch and require even more planning than we currently do, but we’re somewhat resilient here and we’re used to meal planning. My sister and BIL have gotten a CSA for a donkey’s age and they’ve both mentioned that it does require that you do some meal planning – but since we’ve been on that bandwagon for years, this just means we now have a set of ingredients that are must use items. Now, #4 is the more interesting one. As you’ll learn over the course of time, I have a bit of a geek streak. I use Excel for all kinds of things, like tracking our charitable donations and keeping a makeshift address book for the house. At work, Excel is one of my BFFs…the kind of BFF that you beat on frequently in a sadistic fashion bend to your will to make all kinds of cool things happen so that people will think you can make magic. So, this is where Excel is going to come into play. I know the contents of my veggie box down to the partial ounce – we weighed everything when we unloaded it in the kitchen. I plan to go to the grocery store and feed the prices into my spreadsheet, to allow me to calculate what my veggie box would have cost had I gotten the same produce at my store. Full disclosure: I wouldn’t normally get all of these things at my grocery store. More to come on this topic, as I figure out what the meal plan will look like, get some prices so I can see how I’m doing price-wise, and start identifying (or creating) recipes to use all this yummy goodness. And, based on the corn, carrots, peppers and apples we sampled at tonight’s dinner, yummy is the name of the game. The food co-op I participate here in AZ is a $15 contribution for non-organic and $25 contribution for organic. 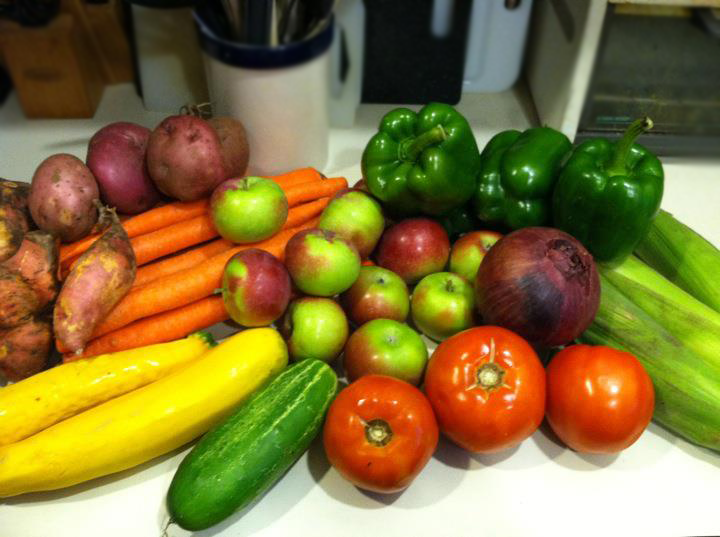 We typically get 5-6 fruits and 5-6 veggies a week, depending on what is cheaper and in season for that particular week. I had quite the learning curve, but have loved the experience of the food co-op of the last year. I think it has taught me a lot about giving up my “comfort” fruits and veggies, and branching out to try new things. It’s also helped me identify what produce is in season when it’s cheapest to get it. I haven’t had a chance to do full price comparisons like you will be doing, but I may try to start, it’s something I’ve wanted to start doing. Many of the CSAs around my area are either completely done, early in the season, or offering slim pickings, as there was so much damage from wind, rain & flooding to farms in the Hudson & Mohawk Valleys. Ours has been smaller than usual, and may end early this year: but that is the nature of a CSA. Last year’s was full to overflowing and I still have kale & chard from last Fall in the freezer.